We launch our Summer Cocktail Series at Didriks today! Are we excited by the prospect of having weekly cocktail hour til the end of the summer? That's a rhetorical question. Will you be getting excited with us? We hope that's a rhetorical question, too. Pronounced "mo-HEE-toh" (not mo-GEE-toh, like I heard a very pretty and ill-informed woman say one time at Liberty Hotel), the mojito is particularly near and dear to my gustatory heart because of how I was introduced to it: I was finishing up my teacher training in France and met up with my sister to travel for several more weeks once my training was done. It was June and we made our way down to Nice. While there I met an anaesthesiologist, a charming French Algerian, who invited us to dinner of pâtes (that's French for pasta) with pesto and later took us out dancing at a Latin club. It was in the club that he ordered for me my first mojito. I don't know if it was the glorious pastel colors of Old Nice and the Mediterranean, or the best pesto pasta I've ever had still doing a happy jig in my belly, but I haven't been able to get that mojito out of my mind and I've been chasing the prefect mojito ever since. This recipe comes close. Really close. Melissa chose the Match Pewter collection to serve the cocktail, which was a great pick. The old world feel of the pewter made me think of the Spanish colonial architecture in Havana and the pastel colors in Vieux Nice. A classic cocktail in classic beverage service. This recipe is a great way to make a large batch of the cocktail. Often prepared one at the time at bars and restaurants with the muddled mint left in the glass, this recipe strains the crushed mint and run muddle making it a cleaner and more refreshing looking drink but without having to compromise on taste. 1 1/2 cups light rum. We used Bacardi White Rum as recommended by Rodrigo Lenzi (("Rod", as he introduced himself, also advised us on the wine selection for next week's Dinner Series. Read more about him then!)) , Wine Consultant, at Cambridge Wine and Spirits. Reserve 6 mint leaves for garnish. Place remaining mint leaves in medium bowl like the medium Rosle deep bowl. Mash with wooden spoon or, better yet, the Rosle Fruit Muddle/Caipirinha Pestle until mint is aromatic and oils are released. Juice the limes. We used the Rosle Citrus Reamer, which worked perfectly. Add rum and lime juice and stir until sugar dissolves. Add club soda to pitcher; gently stir. Fill each of 6 glasses with 1 cup crushed ice. 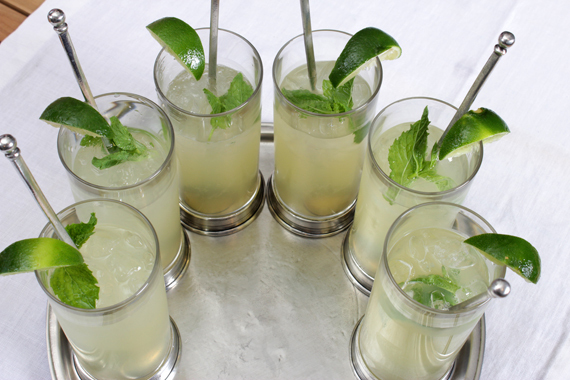 Pour mojito over and garnish each glass with 1 mint leaf and 1 lime wedge. More pictures available at Flikr. Recipe adapted from Epicurious.com. Photographs by Nathan Brescia.